Self Watering Container plant roots shouldn’t be a mystery. If you ever wondered what happens to them, take a look at this photo. It’s the root system of a healthy banana plant using my conversion technique that needed a bigger pot or a severe cut back of its roots. I went the repotting route. 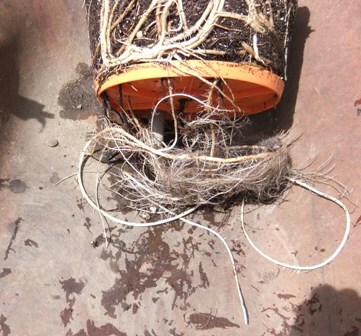 Notice how the roots run atop the reservoir (removed for the photo) as well as below. Awesome (as are all plants)!